Everybody has a dream. If you want your dream to come true, you need to work hard. You can’t just sit at home and hope your dream will come true. I have a dream. My dream is that I hope one day there will be no more orphans. I feel sad sometimes because I feel like that can’t happen cause there are so many orphans all over the world. But mama says that you have to help one child at a time and not be sad that so many wait. Sometimes I get sad and don’t think God has a plan for my life. I feel like I can’t make a difference because I’m just a little girl in a wheelchair. How can I help the orphan? 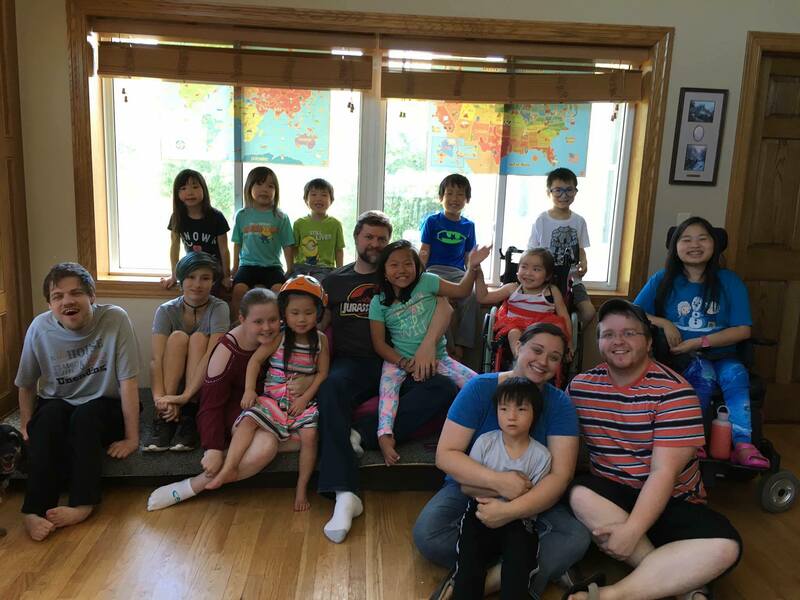 How can I help orphans gets adopted? Then sometimes he sends people to show me that I do make a difference. I got a comment from the Netherlands that said I helped a little boy and it made me feel so good. I’m hoping it’s the little boy that I think it is. He’s cute, silly, and really funny. I’m so happy he has a family. People need to adopt older children too. If God tells you to do it, you should follow God’s plan for you. Kids understand what family means. When you adopt an older child, you let them know their life has worth. But some people don’t think about that. Sometimes I see my mama’s Facebook and I see children wait who can’t walk or walk slow, these kids wait cause the parents don’t want them. I want people to understand that even if a child has a problem, they need a family to love them. When I had second surgery, they doctor told me I could dream about anything – being a princess, driving a beautiful car, get married – but I said, “I just want to dream about there being no more orphans.” After I got better mommy and daddy help me start Jasmine’s Dream. My dream is to help 1,000 kids. We send our allowance, raise money, and mommy and daddy help. 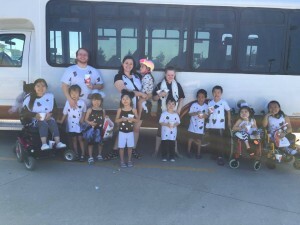 We buy adoption t-shirts, we support Reece’s Rainbow 5-5-5 for families, we sponsor children, we give to Love Without Boundaries unity fund, we purchase from adoption auctions, and donate whenever we can to help kids get adopted. We even helped buy a yak for a family. There are lots of ways to help. My three middle sisters help me. They believe in Jasmine’s Dream too. Mama calls us the Fab Four. The four of us think about the future and how we can help lots and lots of kids. My sisters and I hope that one day no child gets left. We hope that China, Africa, and the whole world can stop leaving children and take care of them. That will be a happy, happy day. I believe my sisters and I can change the world. Could I Get Any Further Behind? Dan asked me the other day, “How long has it been since you’ve posted a blog?” He went on to tell me I should add more to two of my longer Facebook posts and share more of what’s been on my heart. I often post on Facebook because it’s easy to pick up my phone and add a picture and a small comment. It’s a great way to remember the cute things the children have done throughout the day. I don’t have to have a lot of time to collect my thoughts or get pictures together, but I still try to continue writing my blog because it’s the journal of our lives. I use the blog mainly to remember all that God has done in our lives. I don’t ever want to forget little blue fingers turning pink or stories of little hearts healing. Dan and I have been allowed to be a part of some really wonderful stories of hope and healing. It’s a true blessing, one we don’t take lightly. But somedays it’s easy to forget all that God has done and to get caught up in the small annoyances of the days. My words in this blog are a reminder of God’s faithfulness. My words are there for my kids to read about as they get older. I want to tell it to my children so they can tell it to theirs. God’s faithfulness abounds. Dan’s words got me to thinking so I decided to take a look at my drafts. Codey had his wisdom teeth taken out today so it was the perfect time to sit in the quiet and make a list of all the blogs I’ve started writing and haven’t finished yet. Max & Elyse Welcome Home! First Year Anniversary – where did the time go? We are Going to Be Grandparents! Hmmmm….I don’t believe I am doing so well on the “recording their year on their birthday” plan. It’s not like my life is busy or anything. After all based on what I’ve been told lately, my older children are raising my younger children so that must mean mama has lots of free time. If you’d like to catch up with what our family has been doing, you could check out Cassie’s blog, Thankful For The Crazy or Jasmine’s blog, Flower That Blooms. Jasmine’s last blog post talks about her dream. We are trying to decide where to take Jasmine’s Dream next. The girls recently reached the 200 children helped mark. Jasmine’s initial goal is to help 1,000 children. They have dreams of t-shirt sales and items they can sell in an Etsy shop. The FAB Four are going to change the world. They have big plans to advocate and help as many children as they can. They have great big wonderful compassionate hearts. It’s fun to watch their little minds work on what they can do. 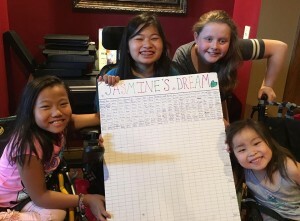 It would be a wonderful day if Jasmine’s Dream came true – A family for every child. I’ll leave you with a couple cute pictures for those of you not on Facebook group, Seriously Blessed By Adoption. They loved the fireworks display. 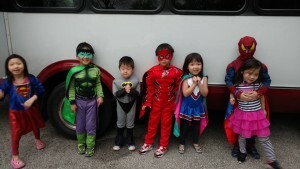 We even dressed up as super heroes and headed to Krispy Kreme for Super Hero Day. The kids love dressing up. They wear costumes all the time at home and any excuse to get to wear a costume out in public is “super cool” according to Eli. It does make for some really fun memories. Praying your summer is going well and that many happy memories are being made. Hold those kiddos tight and give them an extra hug or two. Take the time to blow some bubbles or lay on a blanket and watch the clouds go by. I don’t know about you, but I feel like summer is going by much too quickly. God bless all of you who have uttered prayers on our behalf. Thank you for standing by even when mama doesn’t get much writing done.